I'm exhausted and frustrated (note my strained facial expressions) and I don't want to whine on my blog. Goodnight. I'm sorry you're feeling frustrated, and I hope you're feeling better soon. Have a good sleep! I look much less polished when exhausted and frustrated! PS: I really like Skins too, but seasons 1 and 2 were the best of all. Oh my... at your worst, you look fabulous. That's not fair! 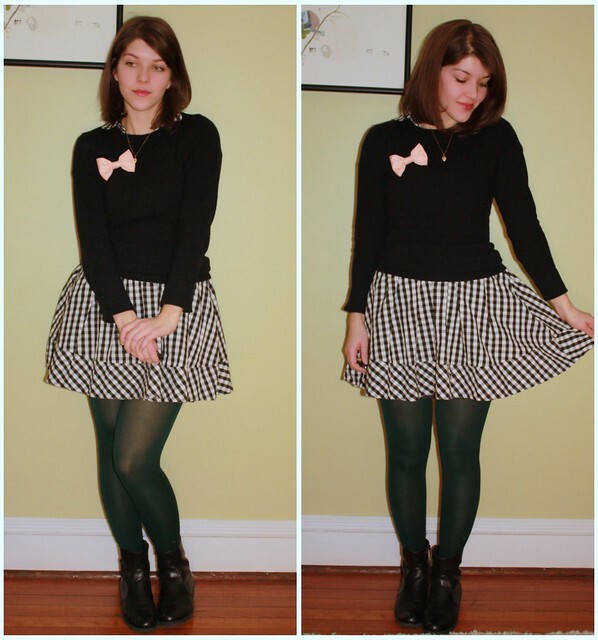 This outfit is amazing -- on you, in particular. You have such an appealing youthfulness and these clothes emphasize that natural quality. Even tired and grouchy, you come across as an angel. Hope this day is treating you better! Love that cute bow, very pretty. I hope you feel less frustrated soon - and that things are okay. Love the cute outfit though! very well put together and sweet as cupcakes. That's a really cute skirt you're wearing by the way! Awww :( hope tomorrow is better for you! I love your dress, so sweet with the jumper over it!! :( hope this feeling doesn't last! you look too cute to be so frustrated! 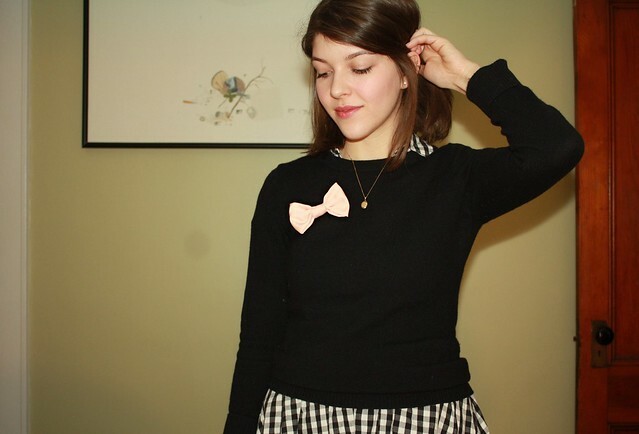 That bow pin is such an adorable idea! I also love the hunter green tights, I need some! No mail yet... I will keep eagerly waiting for it haha. My Vintage Handbag Line – now available on Etsy!